Evie had made some great strides in communicating with us. She was at first only signing "please" for everything. Please I want you to pick me up, please I want to stop eating, and please open the box. That got very confusing for us, and frustrating for Evie. Now Evie has refined her talking points and it's so much easier to know what she wants. Thank you, Rachel Coleman and Baby Signing Times!! Talking Point #1: Open. This can either be signed for open a box so I can wreak havoc with its contents, or to denote that the doors on the bus open and close. Talking point #2: Music. By running her hand down the other arm in a vague fashion, Evie tells us that she would like to watch music videos on her iPad. She does this more and more ferociously until we understand just how much she would like to listen to music. Talking point #3: Yes. This one's new! If we ask her a question and then ask her if she means Yes or No, she signs Yes with her fist. This is handy when she keeps asking us to change the song, until she hesitates and we ask, Do you like this one? And she signs Yes emphatically. Talking point #4: Cold. When it's time to put on her coat, we sign that it's cold, and then she does it. Cutest thing ever when she holds up her fists and pretends to shiver! Talking point #5: Up. Evie loves to crawl over to us and ask us to pick her up. Highly effective when she makes puppy eyes. Talking point #6: Change. Evie has now grasped the idea that if you don't like the song, you can change it. Or mommy can change it. This sign becomes coupled with loud whining if she particularly does not like the song. There have been a couple times where I can't say I blame her--the songs were quite badly sung. Talking point #6: Love. Sometimes Evie will suddenly lean over and kiss us. We tell her we love her and do the sign for love by crossing our arms over ourselves. It's amazing how many baby books have the word Love in them. Every time Evie hears the word, she makes the sign for Love. Talking point #7: Please. This sign basically says everything else Evie could possibly want. My next goals are "clean up" and "let mommy sleep." When is a good time to start Baby Signing Times? I think every kid is different. For Evie, she didn't really start paying attention until around 18 months, even though I tried to show it to her around 12 months. But I have friends with kids with DS who also started watching around 6 months. A tip: sometimes the Signing Times company will make their digital version on sale for $5 and you can use their app to access whatever you buy. Also, Evie prefers the Baby version as opposed to the regular version, but some kids are the opposite. I am glad that Rachel Coleman of Signing Times has won an Emmy for her programming. She has really changed the world through helping kids to communicate, and that's not an exaggeration! Evie has moved on from Baby Signing Times to Rachel and the Treeschoolers on Kids Youtube. Rachel Coleman does not disappoint. Some good first words are here: http://www.babysignlanguage.com/chart/ Our Speech-Language Pathologist made laminated flash cards that have pictures of her plastic food toys on one side and the sign language motions on the back. I am a little intimidated by the sheer number of signs, but I will chip away at it! One day, the sign for hot dog will be very handy. I'm sure of it. Signing 'Open' or sheer excitement? You decide! 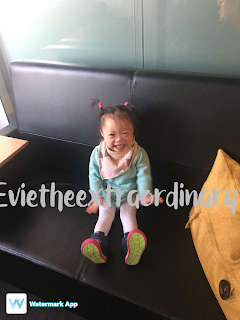 Evie has surgery for her eye turn (strabismus), ear tubes (myringotomy), and to remove granulation tissue around her g-tube. We are taking advantage of her being under anesthesia. Go big or go home, right? Thanks for your prayers that everything will go smoothly and that she won't have to stay the night for monitoring.